If I speak “POLITICALese”, am I bilingual? In news of average Joe behavior being frowned upon in politics, one can look to Tajikistan. They blocked yet another YouTube video. The third this year, but who’s counting? This one involved their President as he allegedly sang and slurred his way through a song at his son’s 2007 wedding. Now, personally, I would find myself feeling a bit closer to a person whom I thought acts just like any drunken relative we all have. But, NO. Then again, their country is a little different from ours. So, what about our country? There is currently a campaign in Massachusetts for the Senate seat left open when John Kerry became Secretary of State. A man by the name of Gabriel Gomez—a former Navy Seal—is running against Democratic challenger Ed Markey. Ed Markey, in case you don’t know, has been in some form of office since 1973 when he was elected to the Massachusetts House of Representatives. Needless to say, at 40 years, one might call him a career politician. On paper he is living the American dream and has—evidently—yet to learn Politicalese. So henceforth, I will call Mr. Gomez, the “Everyman”. OK! Pond Scum. Hey, that’s bad? I think it’s a breath of fresh air… well figuratively, of course. But he speaks in a way—with words I understand—and naysayers are making this a big deal? Please. I want to understand the person who supposedly represents me. I do not want to feel as if every sentence is so calculated and needs some sort of approval from the Politicalese Police that by the time it comes out of someone’s mouth I am scratching my head. We should all try to remember all of those political appointee’s caught on any given open mic night, saying things FAR WORSE. I want my government to represent ME. Crossword puzzles are hard–Harder still when the answers are false. Harder even MORE when the questions are asked of 8th graders and the “right” answers are treated and TAUGHT as facts. 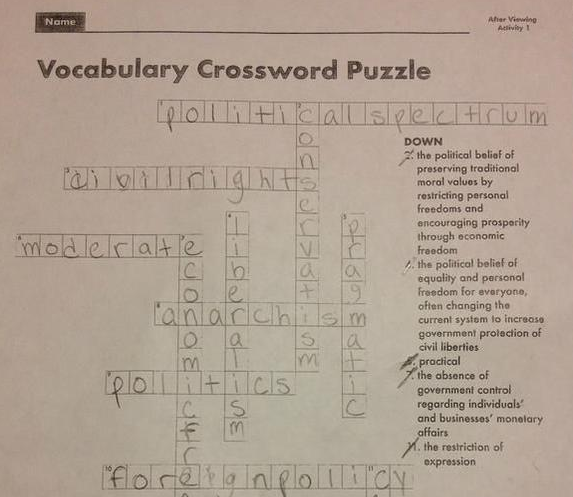 Case in point: Union Grove, Wisconsin Public School where students were assigned to fill out a “Liberalism vs. Conservatism” crossword puzzle. On the surface, to me, there is nothing terrible about learning about politics at a young age, presuming one is making up their own mind and not parroting media, their parents, friends, etc. But can an 8th grader even do that? 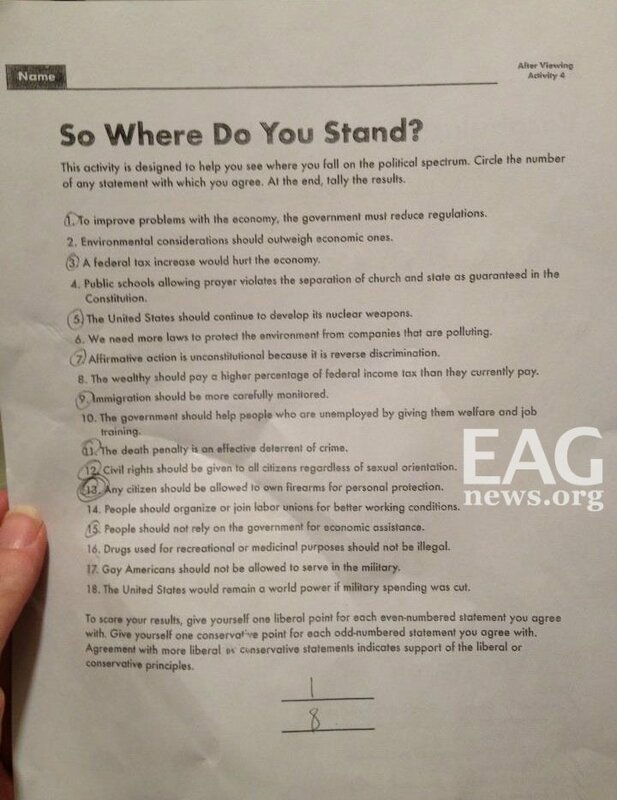 That is not my gripe or the gripe of a mother in Wisconsin, Tamra Varebrook, who was shocked to read part of her daughter’s homework assignment that incorrectly described conservatives as wanting to restrict all personal freedoms. First of all, I am impressed she had what it takes to stand up and say something. In a time when our country is fighting over curriculums, and standardized testing, she made sure the school and superintendent knew they had made a pretty grave error. I will not put a spin on this in any way and will just use my go to reference of the Oxford Dictionary—sort of my defining bible. Whereas finding the word “conservatism” in any reputable reference entity is difficult, I will leave you with Oxford’s definition of the adjective “conservative”: holding to traditional attitudes and values and cautious about change or innovation, typically in relation to politics or religion. I see a bit of a different take on the word. Lest us not forget the other half of this lesson—“Liberalism”. The nice people who created this fabulous puzzle go on to describe liberalism as “the political belief of equality and personal freedom for everyone, often changing the current system to increase government protection of civil liberties.” Hmmm. Fascinating. So, not only do we ask 8th graders to make such a personal statement about their beliefs in politics in a school assignment, we are asking them to make it based on false information. Let us please be realistic about this. I know I was MUCH older before I started forming my own opinions on such subjects, and was at that age (till much older) forming opinions based on my homelife and family and THOSE values alone. 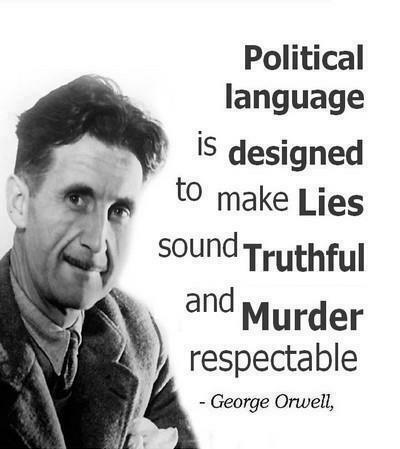 Not only are they being taught misinformation–which is just like getting ALL your news from ONE source–they are being asked to say where they stand on a subject that they should ONLY be learning the tenets of…. Not having to choose where they stand. This is my opinion, of course, but teach the facts, teach them correctly, and hope and pray, your children will grow up to have the knowledge to form their own opinions and the tolerance to accept others. The back of this fabulous assignment I have below for you to draw your own conclusions. Naturally, once publicized, the superintendent was quick to offer an apology and said it will continue evaluating classroom materials. And the writers of this so-called “civics” curriculum have since been dropped. The child of the mother who brought this to everyone’s attention admitted that her daughter has little time or patience for politics or political philosophy and “was just happy to get it filled out.” I am going out on a limb here and going to surmise that this is the general feeling of your typical 8th grader. 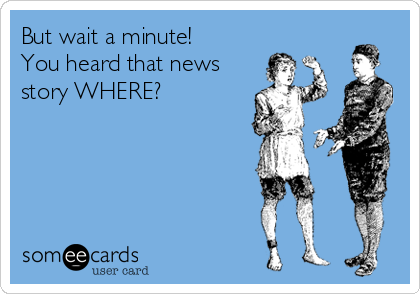 But, what do I know… maybe I will go ask a few. When it comes to teaching CIVICS, of all things, don’t you think it should be accurate? Since, according to Oxford, civics is defined as “the study of the rights and duties of citizenship.” I think our citizens, 8th graders and all, deserve better than skewing their evolving minds in ANY direction at all.